Starting with the introduction of each instrument and continuing through to the application of duple and triplet rolls, students will be well-rooted with a solid foundation as they develop their percussion skills. 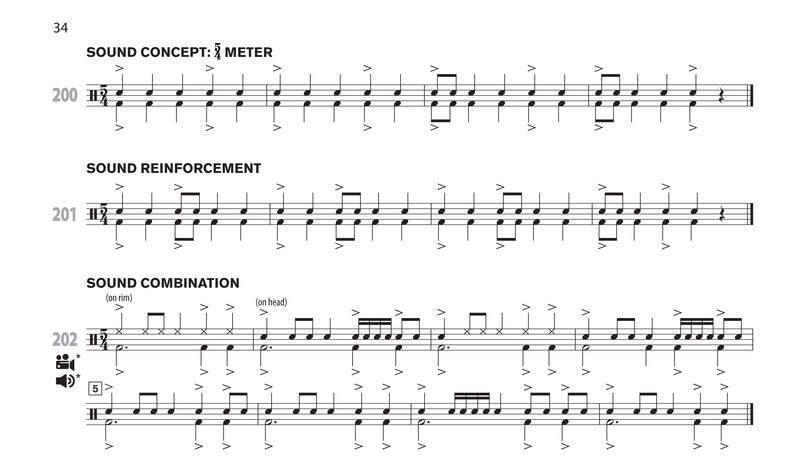 Focusing on snare drum proficiency can help students learn, develop, and apply rhythmic knowledge, technique, and performance skills that can serve as a basis for growth in all areas of percussion performance. 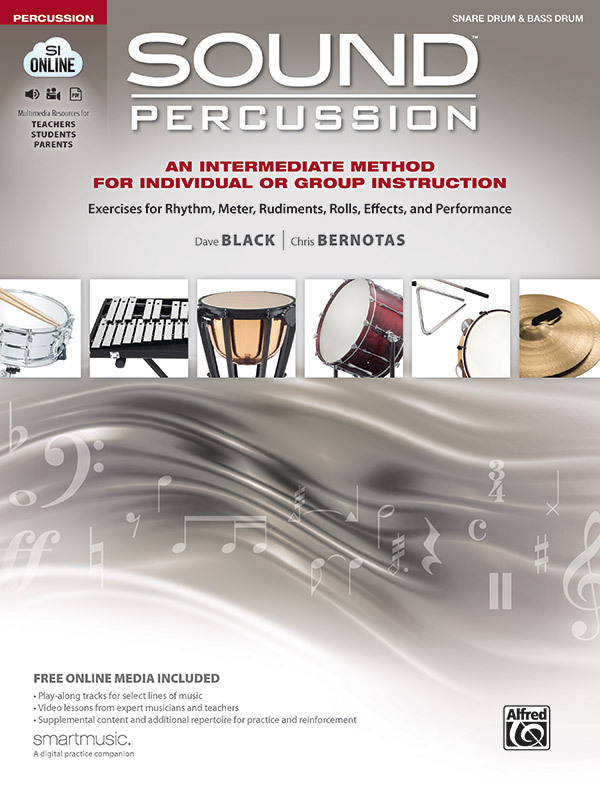 A Your Instrument section is included in each instrument book with information on how to set up the instrument, posture, stick selection and grip, care and maintenance, and other essentials for getting started. SmartMusic connects you and your students through the web. Send assignments to your students using the material in Sound Percussion. Students receive immediate feedback as they practice each assignment, and the best performances are sent back to you to provide assessment. In order to support knowledge retention, the Sound Rhythm section introduces all new rhythms in a logical manner with a lot of reinforcement. New rhythms are introduced in unison (when appropriate) and in 4/4 to provide clarity before introducing more complicated time signatures and syncopated rhythms. The Sound Meter section introduces meters starting with simple duple meters first, followed by compound meter, then asymmetrical meter, making students prepared and confident for the last level that features changing meter. Sound Percussion comes with free access to streaming MasterClass videos, audio and video play-along tracks, and supplemental worksheets on SI Online. No CDs or DVDs to lose! Your students can practice anywhere with internet access, a practice pad, and sticks!. Full performance videos include a quad screen of all five instruments with both wide-screen and close-up shots for detailed examination of performance techniques. Many of the Sound Combination exercises feature videos that include only timpani and mallets so your students can become part of the percussion ensemble and learn part independence. The Sound Rolls section introduces both open and closed rolls, as well as 5-, 9-, 13-, 17-, 7-stroke rolls, and more. Rolls are approached with exercises that help students understand and apply the subdivision underneath each roll. Necessary skills are isolated and experimentation is encouraged to help students learn to develop a clean, clear sound. Students will be introduced to common sound effects created with both snare drum and bass drum, and will be encouraged to create their own unique sounds, such as the canon-shot effect, rim shot, and more. The Sound Performance section provides an introduction to full-length percussion ensemble music. An arrangement of “The Stars and Stripes Forever” and an original piece, “Engage,” are included for students to apply all they have learned in a fun and exciting way.